Via Verde is one of Mirasol’s earliest communities where builder Taylor Woodrow could display the full expression of the Mirasol homes and lifestyle. Limited in size to only one street ending in a cul-du-sac, Via Verde homes are 31 Mediterranean styled homes ranging in size from about 3,800 square feet to over 6,000 feet. 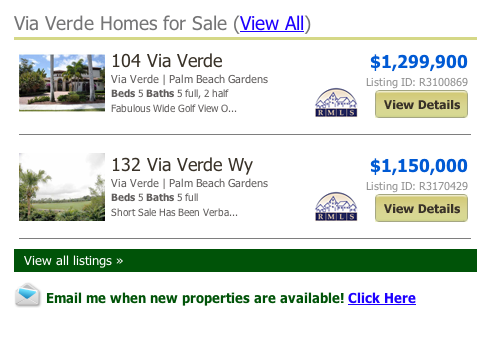 Via Verde Homes online now. All listings & Sold Statistics! As one of the original communities, homes for sale in Via Verde are situated between the fourth and fifth holes of the Arthur Hills designed Sunset golf course, one of two golf courses in Mirasol. So, each Via Verde home has either a lake & fairway view or fairway view. 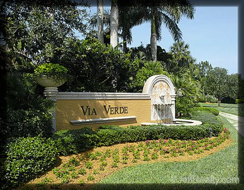 Homes for sale in Via Verde are located close to the guarded, western gatehouse and The Club at Mirasol. Mature landscapes with flowering bouganvillea and towering, stately Royal Palms are a signature of the Via Verde living experience. Entering a Via Verde home for sale you will be met by some of the most luxurious upgrades available. Via Verde homes are among the largest homes for sale in Mirasol with soaring ceilings, fine stone and marble used throughout and space for the largest art collection or fine furniture. Living in Via Verde, you will keep a golf cart in a private garage to join friends at The Club for lunch or to visit the driving range with private instruction. The Esplanade Sports & Tennis Center and The Club pool are just a short cart ride away down Mirasol Blvd. The Esplanade and pool will be the center of activity when friends and family are in town. Whether they are looking for a hard workout, aerobics classes, free time for the kids in the Olympic pool or lunch poolside on the elevated deck, it’s all at The Club. When its time to head out for the evening or to meet friends at one of our other country clubs, Via Verde is the closest community for access onto PGA Blvd. and the Palm Beach Gardens country club lifestyle. And the Palm Beach International Airport is about 20 minutes away via the Florida Turnpike. Our website is always your best choice for Via Verde homes for sale and it would be our pleasure to help you select the right one for you. Posted in Mirasol homes, Uncategorized on July 15, 2011 at 4:58 pm.